Balls aren’t the only things being squeezed ahead of this year’s Super Bowl. Ticket prices are, too. 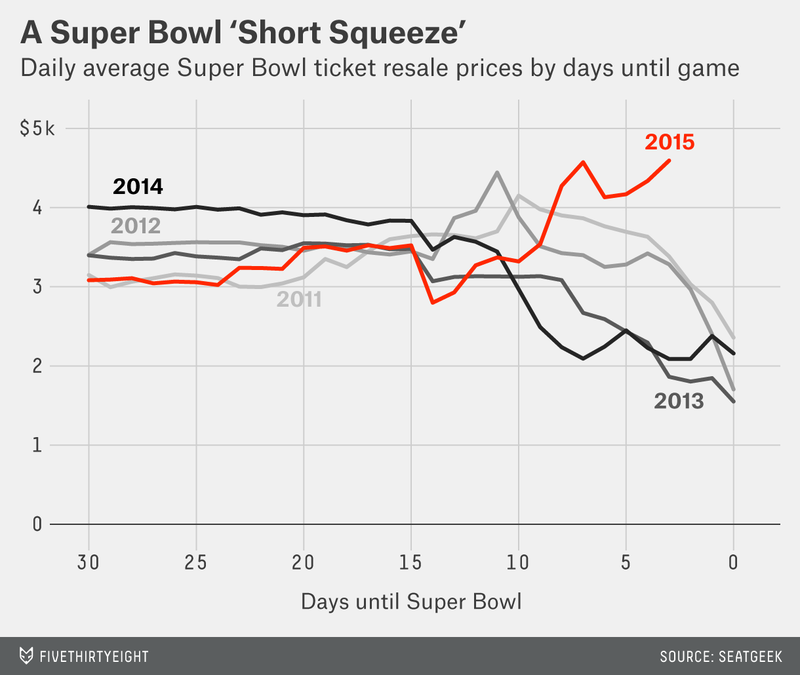 As reported by Bloomberg Business, the Super Bowl tickets you buy may not even exist — yet. Brokers often sell speculative — or “spec” — tickets. They’ll sell tickets they don’t have when prices are high and then buy them closer to the game, hoping prices are lower and thus fulfilling the transaction. Basically, they short sell tickets. “Year after year after year, the market dips and usually those last couple of days before kickoff are the cheapest time to buy a ticket,” Connor Gregoire, an analyst at the ticket aggregator SeatGeek, told me. This is the broker’s incentive to sell short. Brokers selling short has been unusually common this year, Gregoire said. Ira Boudway at Bloomberg suggests a couple of reasons for this. First, Arizona, the site of this year’s game, has been a weak venue in the past. Resale prices collapsed when the game was held there in 2008. And maybe the Super Bowl ticket market is now perceived as soft in general. The market for the game last year also fizzled out. Brokers are big players in the ticket market. Teams often sell tickets in bulk to brokers. This eliminates risk from the teams’ books, and it’s much easier for them than selling tickets individually. For the Super Bowl, 35 percent of the tickets are allocated to the teams playing in the game — this year, the New England Patriots and Seattle Seahawks. Some of those are given to individual season ticket holders via a lottery. But the rest go to the brokers. The host team, the Arizona Cardinals, gets 5 percent. The rest of the teams in the NFL get 1.2 percent each. We can see further evidence of the short squeeze in ticket prices for different types of seats. 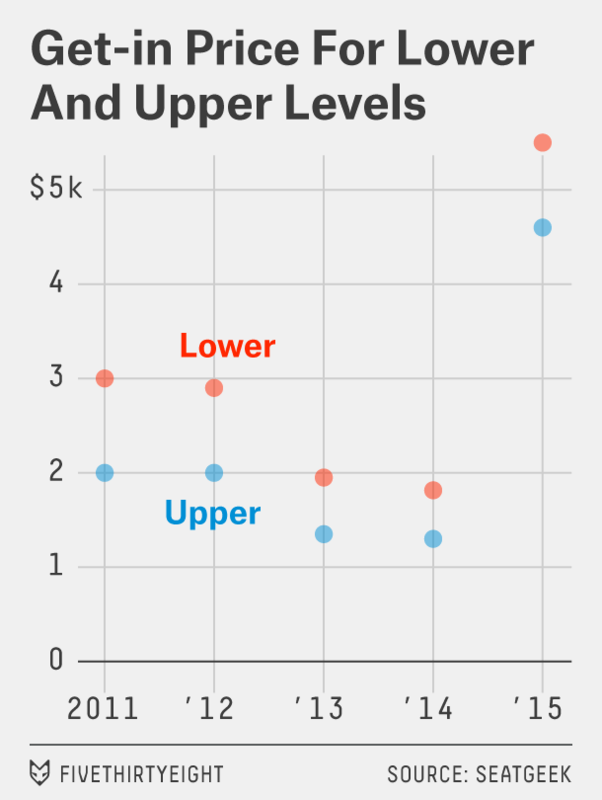 This year’s small spread between prices in the lower level and upper level of University of Phoenix Stadium is such evidence. Spec ticket-selling can go awry in other ways, too. Before the 2011 BCS championship — Auburn vs. Oregon — StubHub briefly suspended trading for that game’s tickets. One broker, a large supplier of tickets to the site, was unable to deliver on the tickets he’d sold. To its credit, StubHub bought up as many tickets as it could to fulfill its customers’ orders. Could it have been Deflate-gate? It’s true that phenomena not explicitly related to a game’s practical implications can bring added attention and affect prices. Recent examples include Derek Jeter’s last game and Mike Krzyzewski’s 1,000th win; ticket prices spiked in both cases. Deflate-gate has brought an acute, twisted kind of attention to Sunday’s game. But Gregoire is skeptical that it’s driving prices. “I really think it would be overstating its impact on the market to say it had any meaningful impact on where prices have gone,” he said.